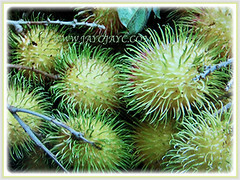 Rambutan or Hairy Lychee is commercially grown for its edible and tasty fruits. The colourful fruits with sweet and juicy flesh can be round or oval-shaped. Besides, the Hairy Lychee is well known for its medicinal usage. Botanical Name: Nephelium lappaceum (syn. : Dimocarpus crinita, Euphoria nephelium). 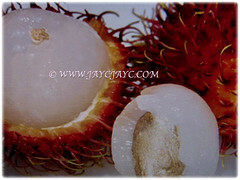 Common Names: Rambutan, Hairy Lychee. Etymology: The genus name Nephelium is derived from the Greek word for cloud. The specific epithet lappaceum means having a bur, referring to the texture of the fruit peel. 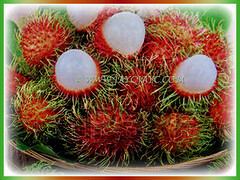 Common name rambutan is derived from Malay word rambutan, referring to the numerous hairy protuberances covering the fruit’s skin. Origin: Native to Southeast Asia including Malaysia and Singapore. It is cultivated elsewhere around the globe. Plant type: An ornamental and perennial fruit-bearing tree. Features: Nephelium lappaceum is from the genus Nephelium that comprises of about 25 species of flowering plants. It is a medium-sized tropical and fast-growing tree that reaches a height of 15-25 m with a dense, spreading crown. It has a straight trunk up to 60 cm wide. The 10-30 cm long leaves are pinnately compound with 1-4 pair of leaflets. Each leaflet is 5-20 cm long and 2.5-11 cm wide with an entire margin. Leaves are elliptic to oblong, slightly leathery, yellowish green to dark green and dull on the upper surface with yellow or bluish-green veins on the underside. 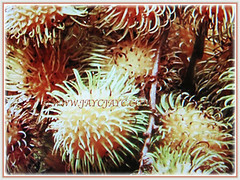 Foliage with hairy red rachis when young is alternately arranged along the stems. The dioecious or bisexual flowers, coloured yellowish-green to white are without petals, small, 2.5-5 mm, apetalous, discoidal and borne in erect terminal panicles 15-30 cm wide. The tree flowers during the hot and dry period and blooms open in the early morning and last only for a day. Eventually the flowers will be followed by round to oval-shaped edible fruits with leathery skin and pliable hairy spines that mature from green to red. Its leathery skin is reddish, sometimes orange or yellow. Within is the edible white or pale pink, translucent, juicy and sweet flesh, 0.4-0.8 cm thick, adhering to the ovoid or oblong is the somewhat flattened seed that is 2.5-3.4 cm long and 1-1.5 cm wide. The single-seeded glossy brown berry has a white basal scar. 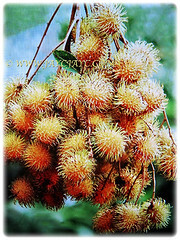 Rambutan trees can be male, producing only staminate flowers and produce no fruit. Female produces flowers that are only functionally female or hermaphroditic producing flowers that are female with a small percentage of male flowers. 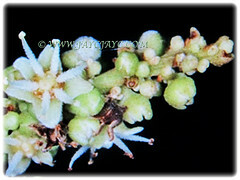 They are borne in a loose pendant cluster of 10-20 fruits. 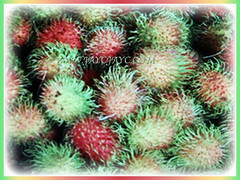 Culture (Care): Nephelium lappaceum or Rambutan can be grown easily with least maintenance. Moisture: Medium water requirement. It benefits when planted in a humid environment. 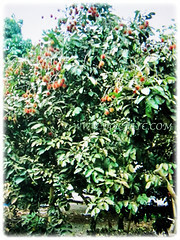 Trim regularly to keep the tree low, preferably between 3-5 m tall for ease of harvesting its juicy and fleshy fruits. Once every two months, feed the tree with a time released fertiliser 8-3-9 to stimulate growth and fruit production. Generally free from serious pests and diseases. Nevertheless, watch out for leaf-eating insects, mealybugs, powdery mildew and stem canker, to name a few. 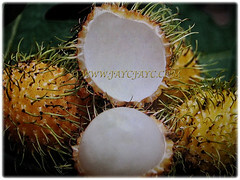 Nephelium lappaceum or Rambutan can be grown in tropical to semi-tropical regions. It thrives in temperatures from 21-30°C. A few days of temps below 10°C will kill this heat-loving beauty. You can grow this tree in a large container or tub in the greenhouse with adequate lighting. Propagation: Easily propagated from seeds that take between 10-21 day to germinate. Alternatively, it can be propagated by marcotting and grafting. Trees from seeds will bear fruits in 5-6 years while marcotted trees in 1-2 years. Usage: Nephelium lappaceum or Rambutan is commonly cultivated in Thailand, Malaysia and Indonesia for its edible fruits that can be consumed raw, stewed or canned in syrup. Soft and containing equal portions of saturated and unsaturated fats, the seeds may be cooked and eaten. 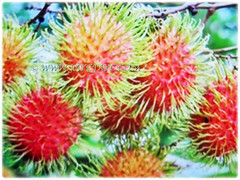 Plant the Rambutan tree and enjoy its edible fruits that are high in iron, vitamin C, copper and antioxidants. Besides, it is well known for its medicinal usage. Fruits are used to treat diarrhoea and fever while roots used as fever remedy. The astringent bark used to treat tongue diseases and a decoction is a remedy for thrush. Young shoots used to make green dye for silk. Oils and fats extracted from roasted seeds are used to make candles and soap in Asia. Attracts birds and it’s a caterpillar food plant.